Journalism educations role in shaping students 'professional views has been a topic of interest among scholars for the past decade in particular. Increasing numbers of studies are concerned with examining students' backgrounds and views in order to identify what role exposure to the tertiary environment may play in socialising them into the industry. 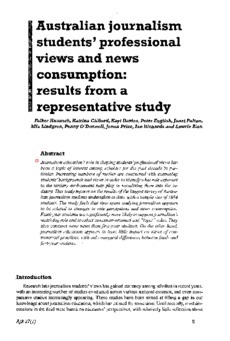 This study reports on the results of the largest survey of Australian journalism students undertaken to date, with a sample size of 1884 students. The study finds that time spent studying journalism appears to be related to changes in role perceptions and news consumption. Final-year students are significantly more likely to support journalism's watchdog role and to reject consumer-oriented and "loyal" roles. They also consume more news than first-year students. On the other hand, journalism education appears to have little impact on views of controversial practices, with only marginal differences between final- and"first-year students.